Rajasthan can be considered a land of forts. 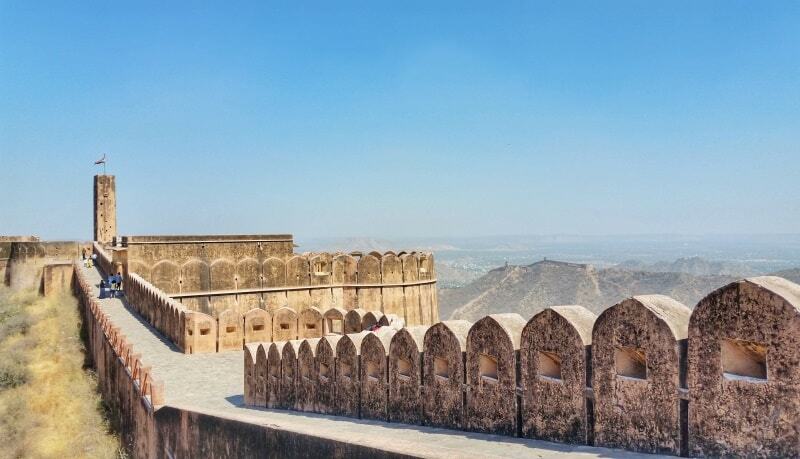 If you want to make it a day of forts, it’s quite reasonable to visit these forts in Jaipur in one day. 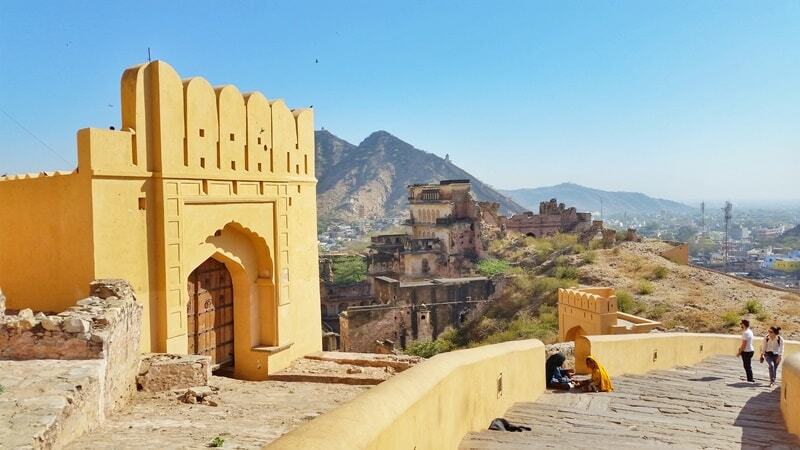 Having a fort day can fit in perfectly to your itinerary for 3 days in Jaipur. You can also have a palace day in Jaipur too! If you look at a map of Jaipur, you’ll see that there are 3 forts that are seemingly pretty close to each other. 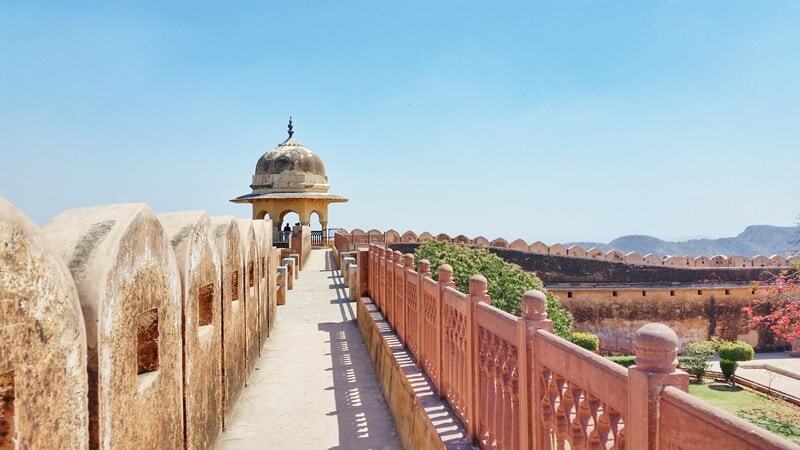 Have a look at the map of Jaipur forts below to plan out your day! The easiest would be to drive to each of the forts. 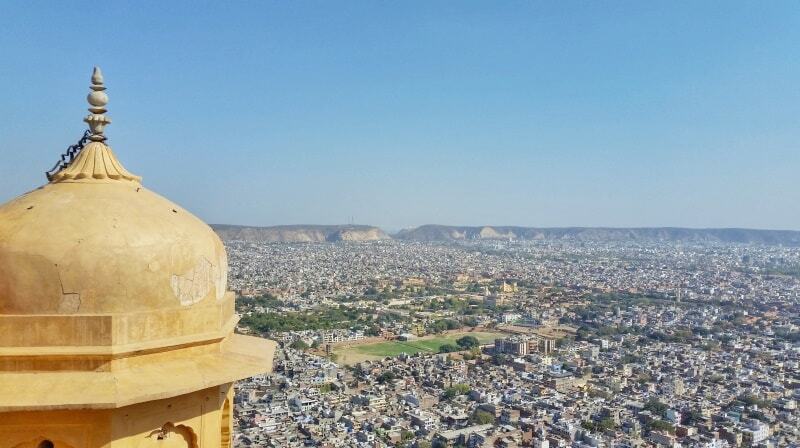 Is it possible to walk between all of these forts in Jaipur?! 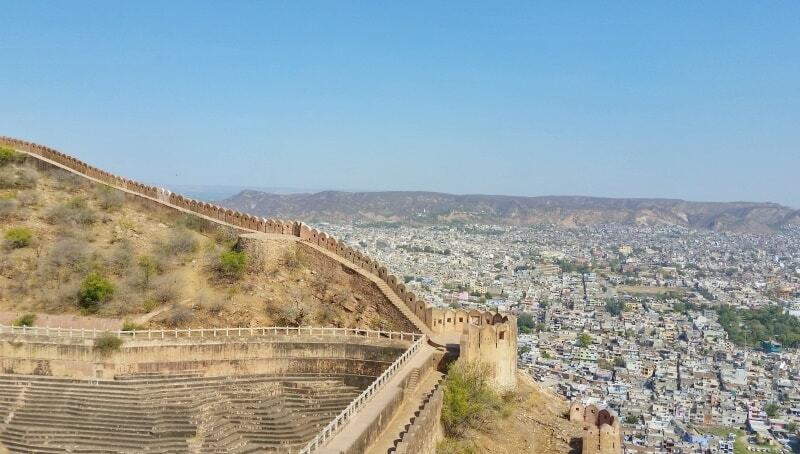 I wanted to walk from Amber Fort to Jaigarh Fort to Nahargarh Fort. There didn’t seem to be that much information online about this kind of walk, but there were a couple accounts of people saying that they have done it. This was confirmed by some local Jaipur people who also said that they have done this walk! 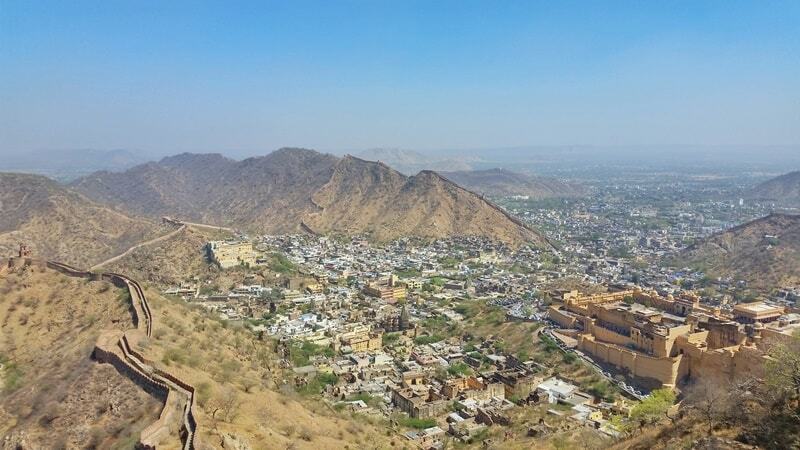 And so… I would be walking the Jaipur forts! I used my favorite app for tracking walking tours like this. It marks the spot you take pictures, and more importantly, it tells you how far you’ve gone! It also tells you how high you’ve gone as well. This is the exact route I took to walk from the base of the first fort (Amber) to the base of the last fort (Nahargarh). I ended up walking a total of 20 km or 15 miles on the day I walked across all 3 of these forts. Walking back to my host’s place! So naturally, walking these forts in Jaipur was an all day affair. 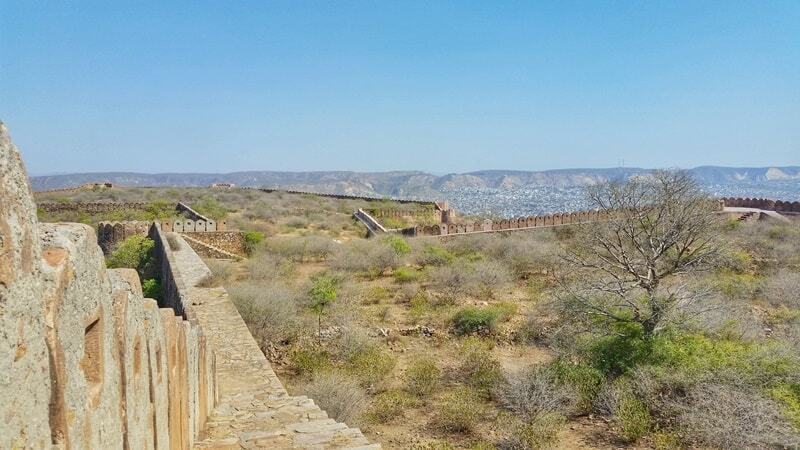 I generally took it at a leisurely pace, including time exploring the fort complexes. I started the day at around 9am and I finished up by 5pm. 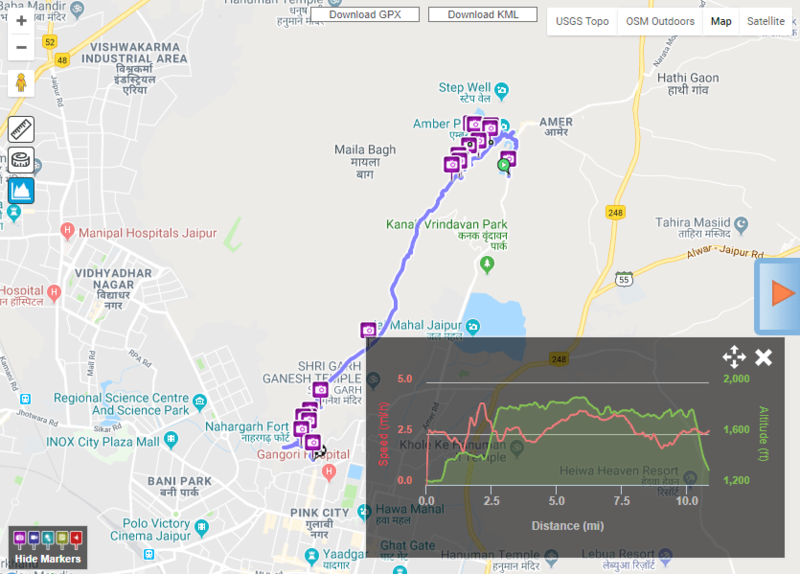 If you start the walk directly at the base of Amber Fort, end directly at Nahargarh Fort, and do minimal walking around each of the fort complexes, you can likely walk less than 15 km. Most of the major forts, palaces, and museums all over Rajasthan will offer audio guides at the very least. Some places will also have guides available. 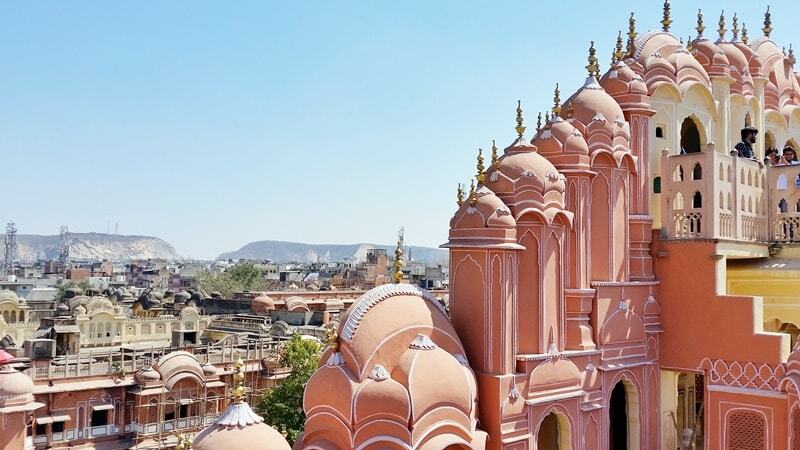 These could be worth paying for at least once so that you can get a basic introduction to the history of the area that is known as Rajasthan today! 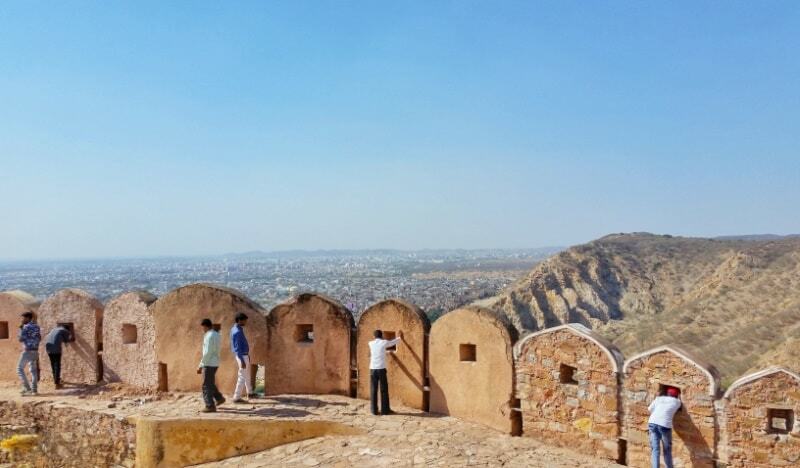 So, what’s it like to walk across these 3 Jaipur forts?! 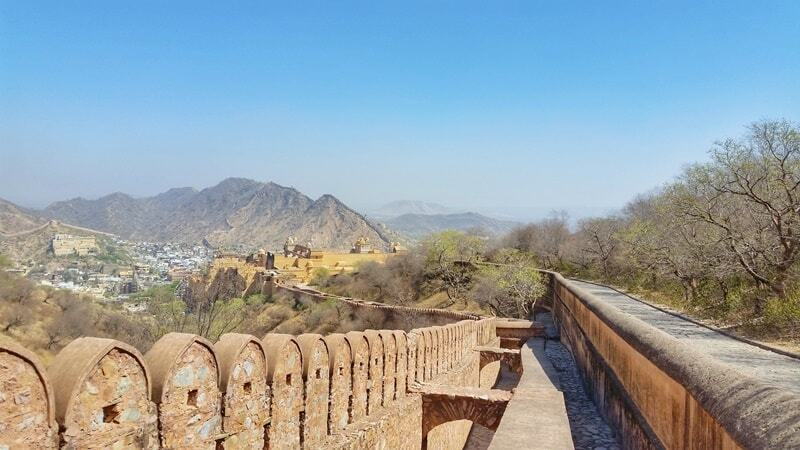 Once you reach the area that’s directly below Amber Fort, there are 2 main paths you can take to get from the main road up to the fort complex. The place I was dropped off by Uber was also the area that loads of tour groups are dropped off as well. I heard a tour leader asking who in the group wants to ride an elephant up to Amber Fort. There were many people who very enthusiastically raised their hands. So while elephant rides are a bit controversial, tourists riding the elephants seem to be quite popular at Amber Fort. It’s best to do research to determine if an elephant ride is something you want to do. 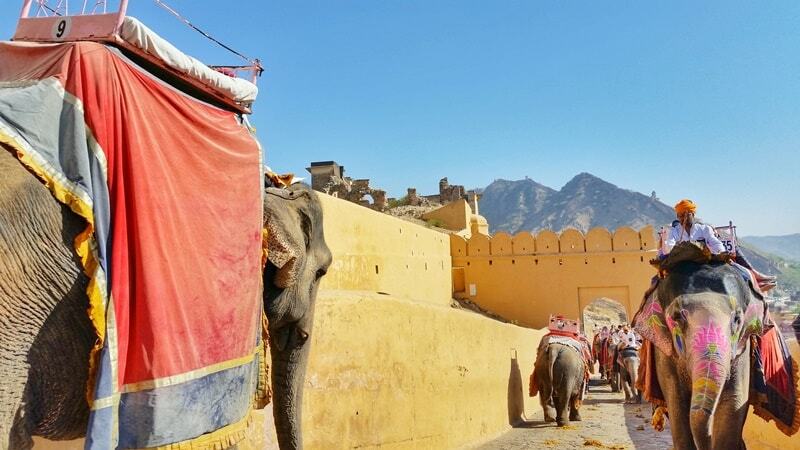 If you prefer to skip the elephant ride, you can take the stairs to get up to Amber Fort. Once you get up to the main fort complex area, there’s an area that you can wander around a bit. This area is free. The Amber Fort complex is also home to Amber Palace, which is a grand palace that’s worth exploring. This is where you’ll have to pay to enter. 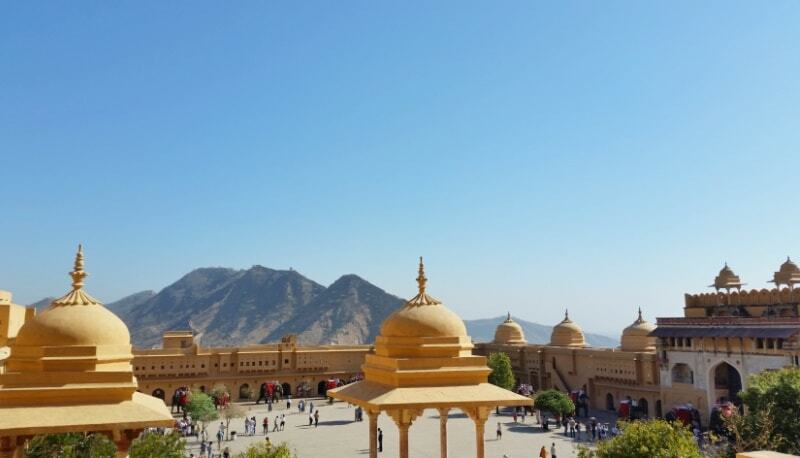 Amber Palace is one of the best palaces in Jaipur. I spent around an hour exploring the area. The entry fee for Amber Fort is 500 rupees (US$8) for foreigners. A tunnel to get from fort to fort?! I found this by accident, and I’m glad I did! It’s easy to miss, or you may just decide to skip it as it’s towards the end of the fort tour. But look for the door that leads to the tunnel. It’s not too long of a tunnel, and soon you’ll start to see daylight! 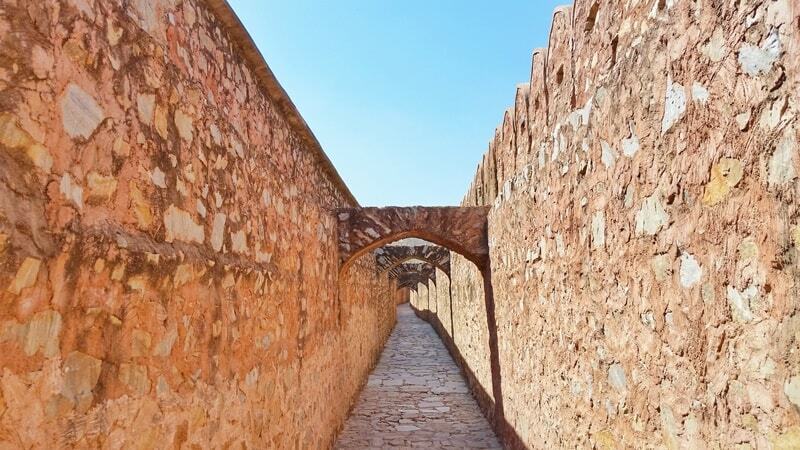 You’re basically walking between 2 fort walls, and there’s no way out except to walk back through the tunnels, or until you reach the other end of it… which will be near Jaigarh Fort! This path again isn’t too long, maybe around a 10 minute walk. 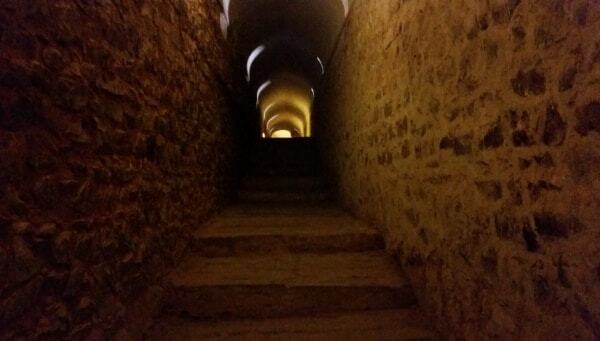 Walking this path along the fort walls, you will soon come across stairs. Once you take the stairs, you’ll end up on a road. From here, it’s a bit more walking up to Jaigarh Fort. 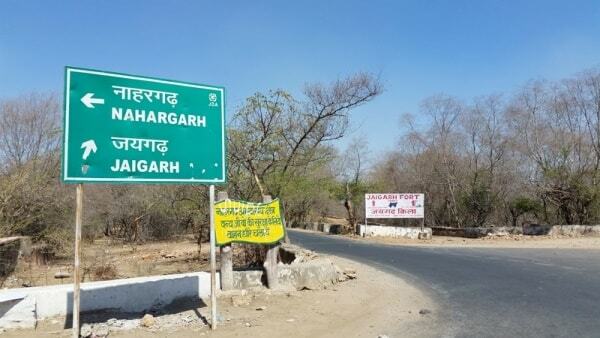 There are 2 main places of interest in the area of Jaigarh Fort. 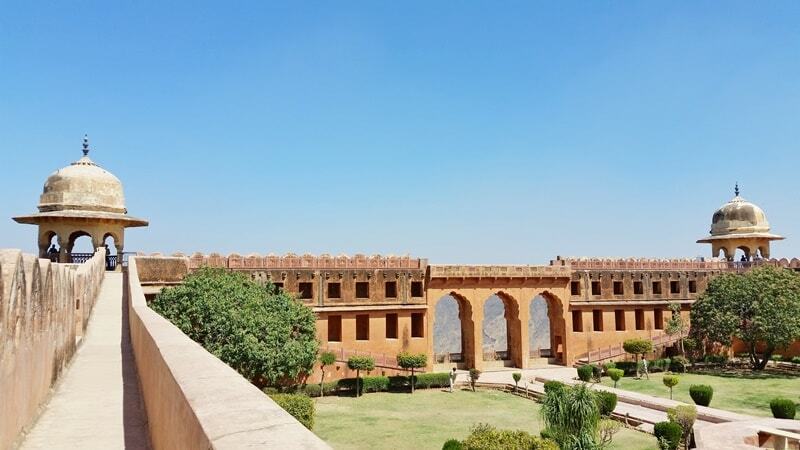 There is a palace within the Jaigarh Fort complex that you can spend around 30 minutes exploring. 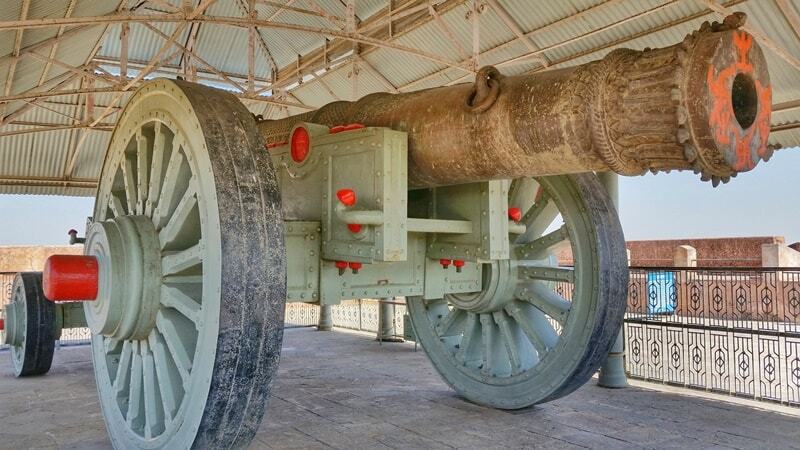 There’s also a famous cannon at Jaigarh Fort that’s said to be the world’s largest cannon on wheels. The entry fee at Jaigarh Fort was 100 rupees (US$2) for foreigners. This is the longest part of the walk! 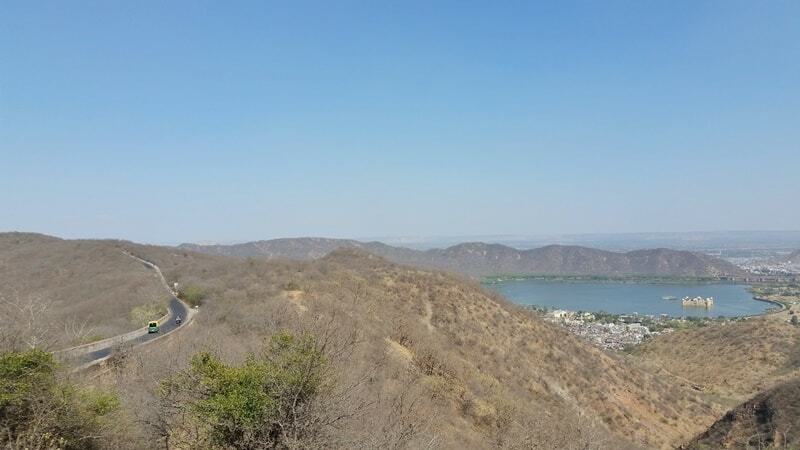 From Jaigarh Fort to Nahargarh Fort, there’s a road for motor vehicles, and you can simply follow this road to reach the next fort. This road will have you walking around 7 km or 4 miles. There’s an overlook or 2 that you can stop at for views of one of the famous palaces in Jaipur, the Jal Mahal on the lake! What if you suddenly decide that this walk is way too long for you?! You will likely have several chances to get out of walking! There are several auto rickshaws at the entry gate of Jaigarh Fort. 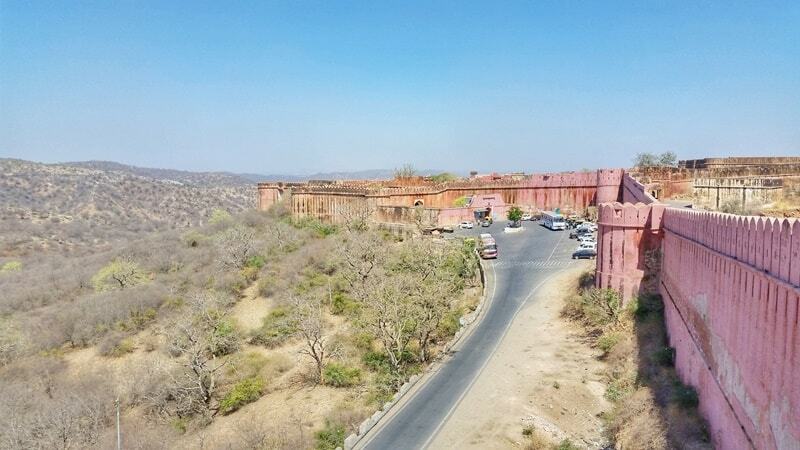 So if you decide after walking around Amber Fort and Jaigarh Fort that you no longer want to continue, you can hire a rickshaw from Jaigarh Fort. 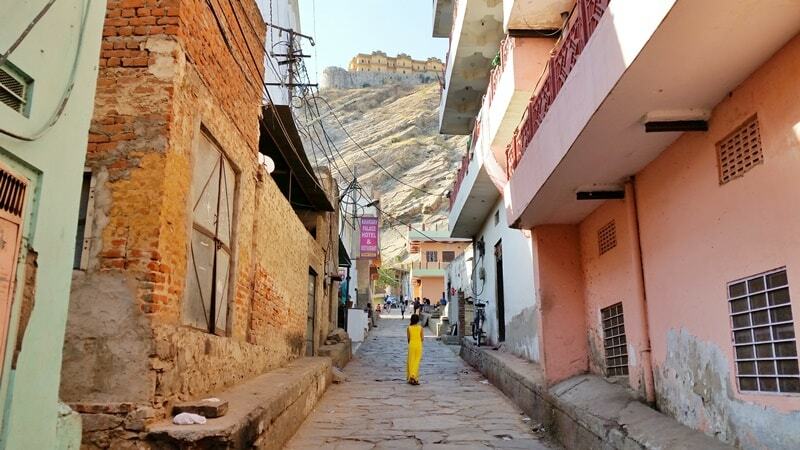 If you start your walk from Jaigarh Fort to Nahargarh Fort, and you decide after walking 1 or 2 km that it’s way too hot for you to keep walking, you will likely have an out at that point too! I encountered many rickshaws on the road between Jaigarh and Nahargarh. Many stopped and told me that it’s very far in an effort to lure me into paying them for the ride. So you can take them up on the offer if you are tired. And finally, you may encounter people who just feel bad that you are walking a long distance in hot weather. These people may offer you a ride! I had a car, a couple of motorbikes, and even one rickshaw offer me a ride for free! Some of these people were very insistent and really wanted to give me a ride. I had to profusely refuse in many cases. So, if you want to attempt the walk but you aren’t sure if you will be able to do the whole distance, there’s a good chance you will be able to be saved by someone, whether it’s paid or for free. Now you’ve made it to the last fort! If you want to take a bit of a break, this can be a good fort to do so. Well, you can find good places to rest at all the forts. But since this is the last fort, you may want to take it all in a little bit more! The entry fee at Nahargarh Fort was 200 rupees (US$3) for foreigners. 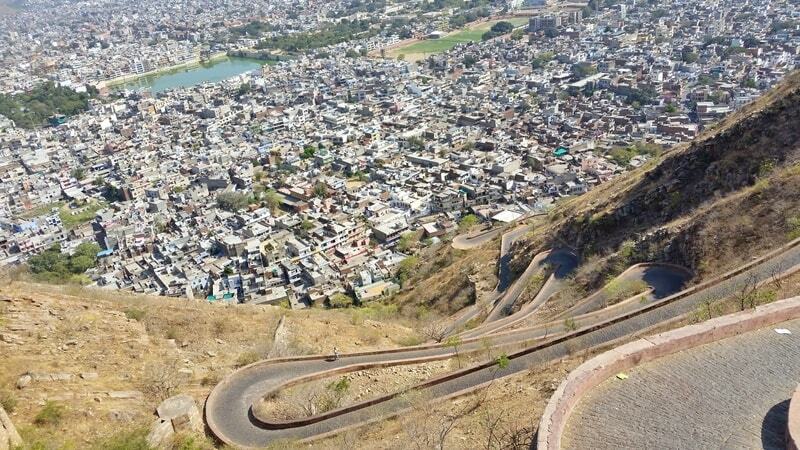 Once finished exploring Nahargarh Fort, it’s now just a winding downhill on uneven grounds to finish up! This is the path you’d take if you were going directly from Jaipur to Nahargarh. It would make for a good workout if you walk up this path! I reached the base of Nahargarh Fort around 4:30pm. From here I had about 4-5 km of walking back to my host’s place. Originally I was thinking about taking an Uber back, but this isn’t a popular area so it was difficult to get one. And as I was walking, a pineapple man came along! Perfect recovery food and drink! 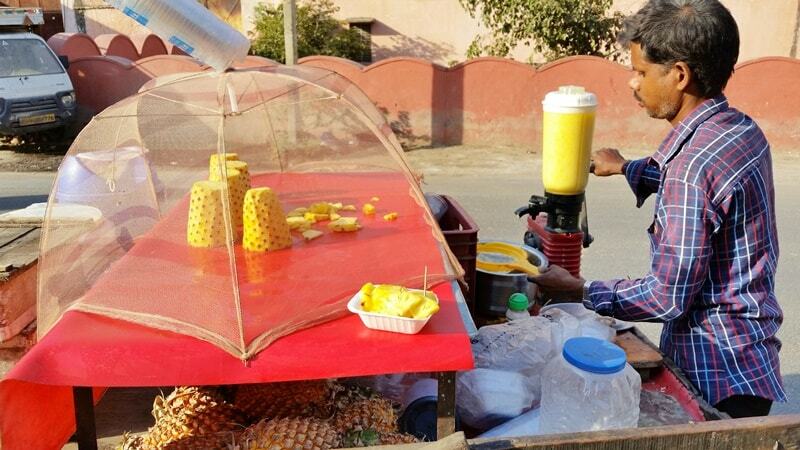 I got cut-up pineapple pieces and some fresh pineapple juice churned right in front of me. BE PREPARED WITH FOOD AND WATER! There are places along the way that you can buy water and snacks, but it’s always best to carry these things with you. Where to next after a day of Jaipur forts?! 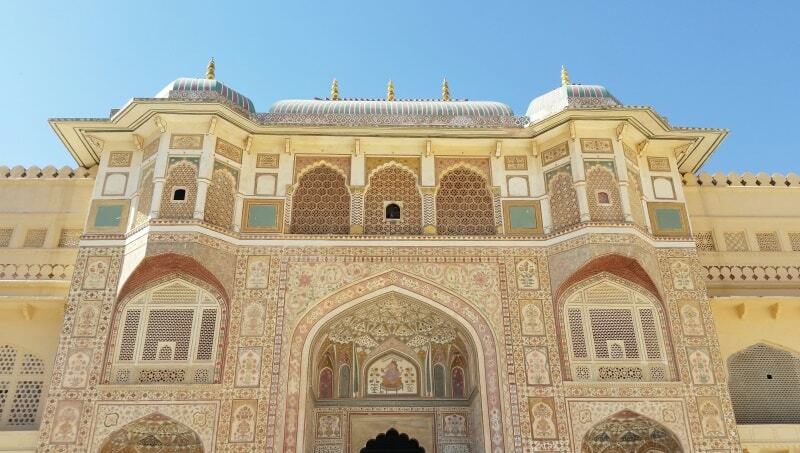 How about a day of Jaipur’s famous palaces?! 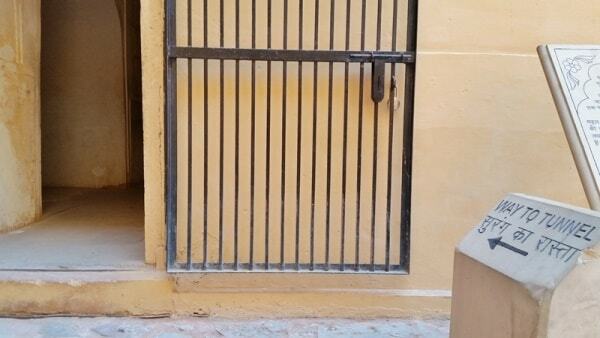 HAPPY EXPLORING FORTS IN JAIPUR!